FRANCE HAS NOW PARTICIPATED twice in the BAMS Student Medal Project. 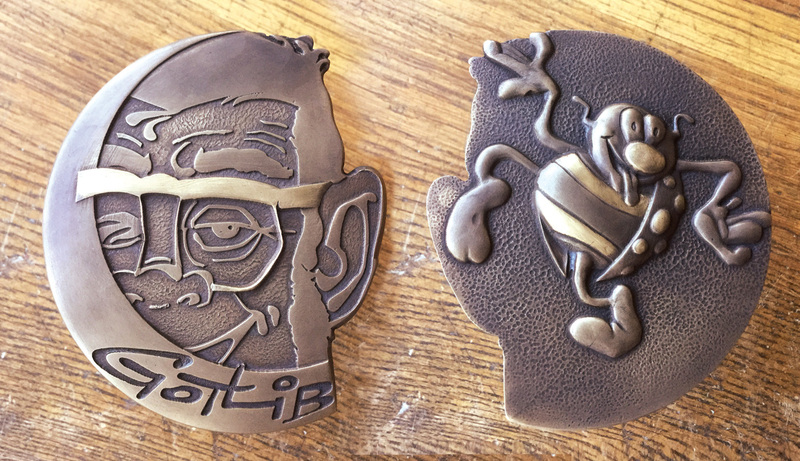 Nicolas Salagnac, professor of engraving at the Lycée Ferdinand Fillod, Saint-Amour, Jura, explains: ‘In 2015 Marcy Leavitt Bourne, director of the BAMS Student Medal Project, asked me to arrange for the first French students to take part. 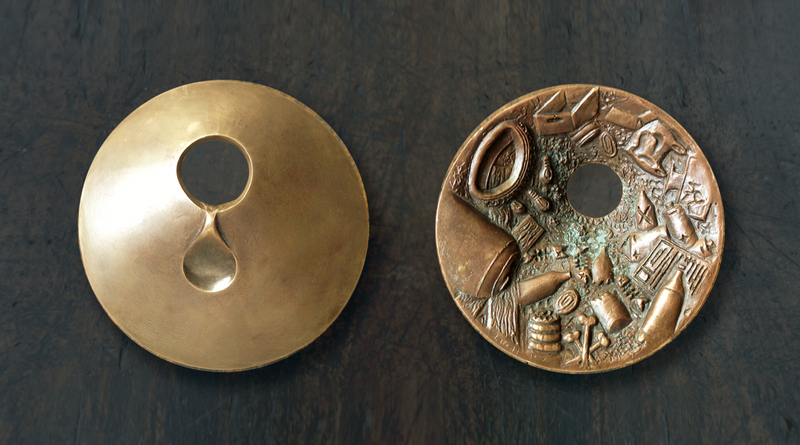 Twice, in 2015 and 2016, ten young French artists sent their medallic creations to the British Museum for the competition. This interesting initiative is a good way of making the art of the medal better known, as it is nowadays often neglected. The work allows the students to question themselves, and they are also curious to see other pieces through which they can place and evaluate themselves. I am happy to see their use of different techniques, as sculptors, engravers, founders. Their research is made concrete by passing through all the stages of making, which is very formative for the students. I have just one small regret. Casting is not the best method and does not always capture the quality of the model made by the student. I would like to have more time to be able to engrave steel dies and make struck medals. But that is inevitably less feasible and more complex. Thanks to this involvement and to some of the students joining FIDEM, I am hopeful that the art of the medal may revive in France, even if for the moment activity is modest. A large thank you goes to Marcy Leavitt Bourne and to all her colleagues who organised these competitions and our involvement. 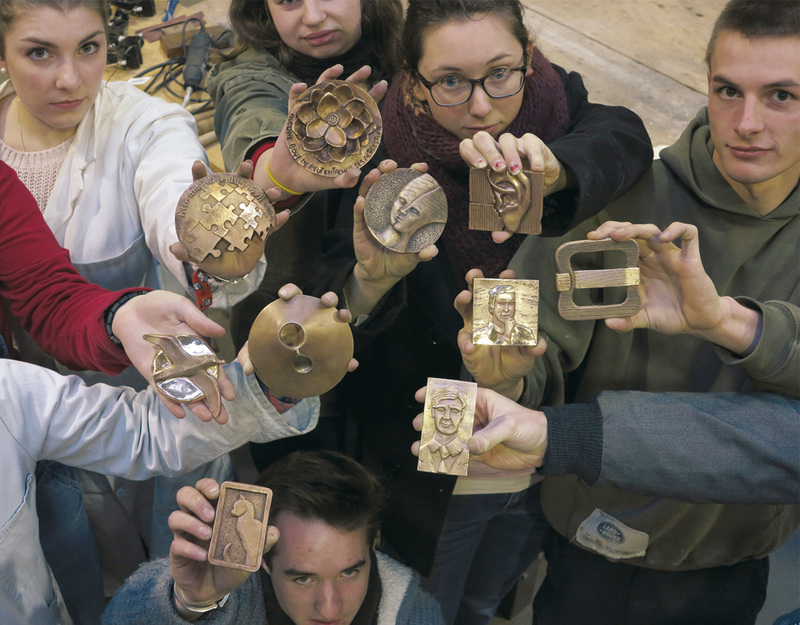 Thanks also to the students and teachers at the Lycée Ferdinand Fillod in Saint-Amour and the Lycée Pierre Vernotte in Moirans-en-Montagne for the medals they have created, and to the foundry teachers at the Lycée Hector Guimard in Lyon for the bronze casting. As reported in The Medal, the winning French student in 2015 was Lucy Pobel, whose Aqua reflected on the symbolic and existential importance of water, and in 2016 it was Romane Cossin, for her homage to the comic artist and writer Gotlib. French students with their medals, 2015. Lucy Pobel working on Aqua, 2015. Romane Cossin working on Gotlib, 2016.